Why Should You Buy a Sit-to-Stand Desk? Standing desks are not a new phenomenon but with the all the recent studies showing the adverse effects of sitting all day, they are more popular than ever before. Standing desk proponents point to the cholesterol-reducing, calorie-burning effects of standing at the workplace, and to health risks associated with spending more than six hours a day seated at a desk. As I am sure you have heard, research has linked too much sitting with heart disease and diabetes, among many other health problems. But at the same time, standing all day is not necessarily very good for you either. New studies are beginning to show that while standing does burn more calories, standing for extended periods of time can contribute to many of the same circulatory issues as sitting as well as lead to knee or other joint pain. The ideal way to solve this problem is by frequently alternating between sitting and standing. Sit-to-stand desks are quickly height adjustable, letting employees individually configure their desks to meet their specific needs without forcing them to either sit or stand. There are multiple types of adjustable height tables and desks. Sit to stand work surfaces come in several different versions based on the method of adjustment; pneumatic, electric or manual crank. One of the critical arguments for the standing desk focuses on the health benefits of standing as opposed to sitting for extended periods of time. However, employees don’t always respond well to being forced to stand all day and have even filed lawsuits against employers for this reason. From this point of view, giving employees access to an adjustable height desk that allows for both sitting and standing is a reasonable move. While a study by UCLA finds that sit-to-stand tables generally don’t encourage widespread standing use among employees, it does place the decision to stand or sit firmly in the employee’s volition. This could reduce employer liability for potential workers compensation lawsuits for musculoskeletal disorders. But the findings of the UCLA study fail to take into account a fundamental generator of value when considering ergonomic system adoption – company culture. Are Electric or Pneumatic Sit-to-Stand Desks Worth the Higher Cost? Many employers are coming around to the idea that adjustable height desks are an optimal solution to the workplace ergonomics problem of having employees sitting all day. But they are not always sold on the idea that an electric or pneumatic adjustable height table is the answer, citing their typically high cost as discouraging. However, forcing employees to manually adjust the height of their table with a hand crank is likely to decrease adoption; using a crank to adjust the height of a work surface typically takes 20 or 30 seconds of physical effort and distraction from the task at hand. Employers have to make a judgment call based on their particular employees and the extent to which their company culture can be relied on to ensure your new investment is being used. Electric or pneumatic height adjustable tables make the process much easier for employees and encourage them to spend more time standing. Since the goal is to prevent people from spending the entire day sitting, the simpler you can make the process of adjusting the table height the more likely people are to use it. Much in the same way that giving employees discount gym memberships does not always ensure they go the gym, merely providing sit-to-stand desks doesn’t guarantee that employees will use them. To increase adoption rates, managers and supervisors need to provide ergonomics education as a fundamental aspect of company culture. It is not enough to provide incentive. Companies that wish to see transformative results have to embed these concerns into their company culture; letting employees know that their leaders are deeply invested in their well-being and are continually looking for ways to make their lives – and their work – easier. It’s a well-known fact that employee wellness programs affect productivity positively. By educating employees on the benefits of standing while working and equipping them with high-quality sit-to-stand desk workstations, you will be able to offer them the best possible chance at maintaining optimal levels of productivity while achieving overall wellness. While you can’t force employees to stand, you can give them the equipment and incentives they need to make the right choice. Should You Buy Yourself a Sit-to-Stand Table? Ultimately the answer to that question depends entirely on one factor, will you use it? The health benefit of sit-to-stand desks, tables and accessories at this point is quite clear. Alternating between a sitting and standing position every 30 to 60 minutes is better for you than solely sitting or standing for the workday. If you believe you are going to use your new sit-to-stand tool, you will almost always find a positive ROI. 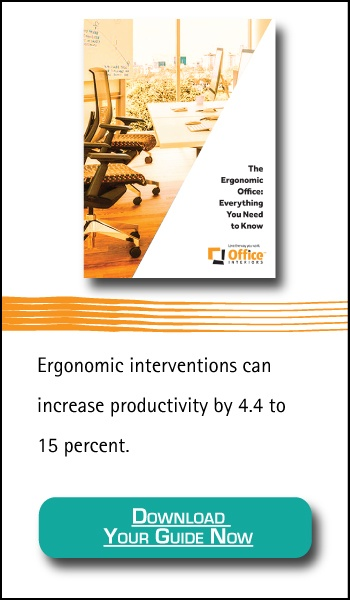 Interested in learning a little more about office ergonomics? 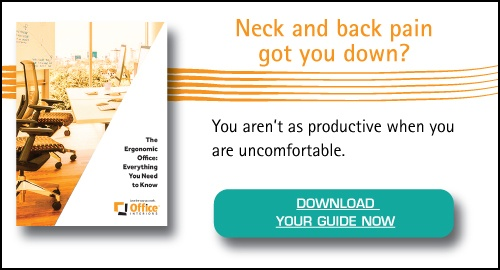 Browse our comprehensive article on Office Ergonomics!